Marold Vera Bartley (nee Adams) – of Owen Sound and formerly Dyers Bay, peacefully at Hannah Walker Place in Owen Sound on Tuesday, January 24, 2017 at the age of 94 years. Cherished mother of Marilyn (Gordon Shaw), of Bruce Mines, Larry (Gloria), of Brampton, Julie (Ted Publuske), of Owen Sound, David (Martha), of Toronto, Eric (wife Jill McFadden), of Owen Sound, and Jean (Mike Campbell), of Owen Sound. Proud grandmother of 22; great-grandmother of 36; and great-great-grandmother of 8. Sister of Bunny Burr Hallman, David Adams (Jean), and Cleve Adams (Jean); and sister-in-law of Irvin Sutter, Viola Adams, and Bettie Adams. 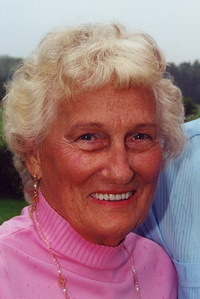 Lovingly remembered by her many nieces and nephews. Predeceased by her parents Percy and Pearl; husband of 74 years, Clarence (2015); son, Ray (2015); brothers and sisters, Tommy Adams, Raymond Adams, Sonny Adams, Kay McNair, Pat Durance, Edna Sheppard, and Lloyd Adams; and brothers and sisters-in-law, Floyd and Yvonne Bartley, Cecil and Lila Bartley, Myrtle and Gordon Robbins, Lorraine Sutter, and Doris and Ivan Hooey. Family invite friends to gather with them for a casual Come & Go Memorial Gathering to celebrate the life service for Marold at the Thomas C. Whitcroft Peninsula Chapel, 272 Berford St., Wiarton (519) 534-5341 on Saturday March 4 from 1-3 PM. Cremation with spring interment in Dunk’s Bay Cemetery, Tobermory. Donations to the Lion’s Head Hospital, or Tobermory Health Services Auxiliary would be appreciated.